Last week I was tutoring a photography student in her home and I didn’t want it to get too formal, so I’d left my laptop back at the ranch. As I was trying to explain some photography principle, I needed an example, and luckily, I had my swipe book with me. What is a swipe book? I swiped the concept from the advertising world, where designers keep a collection of ideas and typography for inspiration. Mine is a standard 9×12 spiral-bound sketchbook. As I find photos I admire, and other examples of outstanding design work, I rip them out of magazines or whatever and tape them in the sketchbook. 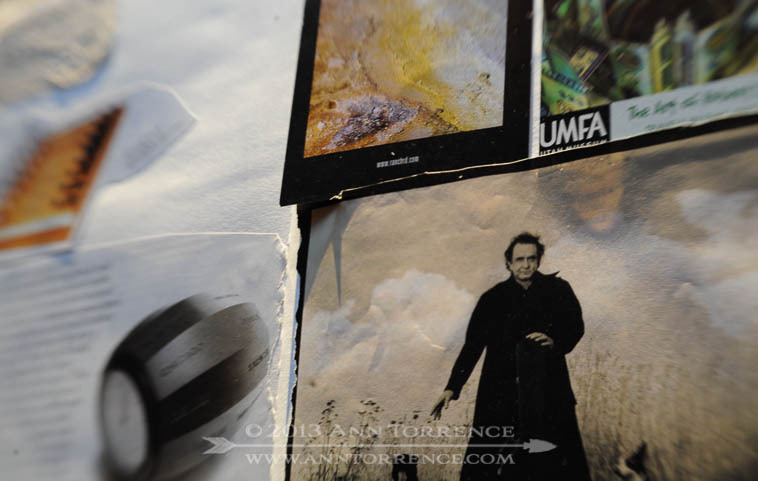 I have collected things like an old promo piece from a birding organization I once belonged to, postcards from museum exhibits, pictures from Outdoor Photographer, even Andy Earl’s portrait of Johnny Cash. I knew I liked a particular image from Vincent LaForet when I discovered I’d clipped it twice! Some folks are using their accounts on Pinterest to collect swipes digitally. But I still like the tactile part of the experience, turning the page and making notes about what I like about each image. The 9×12 format is great in that it can hold most whole magazine tear-outs with room to jot down a few ideas and the source of the image. My teaching style has very few “must-do-this” instructions. I think it’s better, once you understand the basic technical concepts, to figure out what works for you. But I do recommend that all my students create a swipe book. Use it as a tool to study composition and to learn how to articulate what elements of imagery you want to incorporate into your own style. Early on I discovered a strong affinity for particular color contrasts in images that I curated into my swipe book. Later I noticed that kind of color showing up regularly in my own photographs. Eventually I started using it deliberately. It surprises me that stuff I collected ten or fifteen years ago still catches my eye. Good design is good design, period. There’s no point trying to learn from anything but the best. And you may not know how to describe it (yet), but you’ll know it when you see it. Grab it! The great thing about this tool is that your swipe book will be uniquely yours. When starting out, we want to make “good” pictures and it’s too easy to get stuck in what I call the compulsories and the trends. You know, the same shot of the Mormon barn in Grand Tetons, who needs it? You might need to make it, but move on! And you do have a unique set of preferences and ideas. If you forget, you’ve got a document to remind and inspire you. That’s a great idea, though I’m a little afraid I will fill it up with Guy’s pictures. I do a somewhat similar thing on Flickr I guess by marking my favourites, but that’s a limited universe. I do this! I was a little embarrassed to come out of the closet. Mine is in a three binder filled with page protectors. And it rings true about favorite pictures still being the ones I saved from the 70’s. Go Morlboro man!